New Delhi: The Minister of State for Science and Technology & Earth Sciences, Mr. Y. S. Chowdary, has said that biotechnology will be the leader among the knowledge based industries of the 21st century. He said producing affordable products will be major issue for India. He called for efforts to set up a proper ecosystem with sustainable systems, particularly in hubs of rural India. 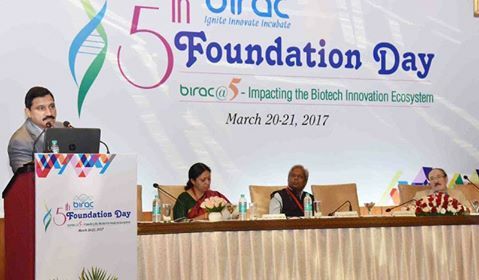 The Minister was speaking after inaugurating the 5th Foundation Day of Biotechnology Industry Research Assistance Council (BIRAC), Department of Bio-Technology at New Delhi today. The 5th Foundation Day themed ‘Impacting the Biotech Innovation Ecosystem’ was presided over by and attended by a large number of dignitaries from the scientific and industry sectors both from within the country and oversees. BIRAC is a not-for-profit public sector enterprise, set up by the Department of Biotechnology (DBT), Government of India which acts as an interface agency to support emerging biotech enterprises to undertake strategic research and innovation, to address nationally relevant product development needs. Through the course of five years, BIRAC has supported over 618 projects, 850 start-ups, entrepreneurs, biotech companies and organizations and 20 incubators across the country, resulting in over 66 products and technologies and 120 Intellectual property rights being generated. BIRAC supports entrepreneurs and start-ups at different stages of innovation – from the ideation stage to managing intellectual property rights and finally to the commercialization of products. Different initiatives of BIRAC target different stages of the innovation ecosystem from ideation stages to proof-of-concept and late stage validation to product development. BIRAC has 9 flagship schemes that are supported by funding from the Department of Biotechnology, and manages 7 collaboratively funded programs with international partners, such as the Bill & Melinda Gates Foundation, Nesta, the Wellcome Trust and USAID, among others. Social Innovation is a key focus for affordable and accessible product development. Dr. K. Vijay Raghavan, Secretary, Department of Biotechnology and Chairman, BIRAC said that Innovation and research must be directed toward addressing the most pressing problems of society. We’re proud that BIRAC and the Department of Biotechnology are spearheading this effort in the biotechnology domain. Since its inception in 2012, BIRAC has created nearly two dozen incubators across the country and supported over 350 start-ups. We firmly believe that social entrepreneurship is the key to creating an inclusive society and our government is committed to providing all the necessary support. The science and technology sector will play a key role in the government’s Start-Up India Action Plan. The DBT, in line with the Start-Up India Action Plan has undertaken a number of initiatives centered on the three pillars of an ideal innovation ecosystem – funding, mentoring and capacity building, and the infrastructure to translate scientific research into commercial products. To this end, BIRAC implements its mandate through a wide range of high impact initiatives, providing access to risk capital through targeted funding, facilitating technology transfer, and supporting intellectual property management and handholding schemes for biotech firms to make them globally competitive. Dr. Renu Swarup, Senior Adviser, Department of Biotechnology and Managing Director, BIRAC said that through initiatives such as Start-Up India and the Science and Technology for Harnessing Innovations or SATHI, the government is ushering in supportive policies and removing regulatory barriers to create an atmosphere of innovation and entrepreneurship in the country. The world as a whole stands to gain with Indian innovators stepping up and changing the way we address the grand challenges we face today. We are proud that BIRAC has created an enabling environment for the biotechnology industry to prosper. The BIRAC Foundation will be followed by the Grand Challenges India Meeting to be held from 21st to 24th March, 2017 which will have the participation of BMGF, Wellcome Trust, USAID and Grand Challenges Innovators from Brazil, Canada, Bangladesh, Korea, South Africa, Kenya, Switzerland.